Taegen is a graduate of the 2014 Fellowship program and is currently a Community Organising Manager with Solar Citizens. Why are you passionate about Community Organising? Why is organising an important part of the solution in your community? A big part of the reason I love my job as an organiser at Solar Citizens is the people you get to meet (and the couches you get to sleep on). Recently I stayed with a volunteer in Brisbane whose job in the solar industry is at risk. 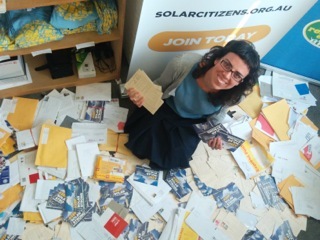 Through Solar Citizens she’s been doing an amazing job speaking out at public forums and to the media, doing our Solar Poll at every market she can think of and getting herself on a first name basis with her local Parliamentarian – all things she wouldn’t have dreamt have doing until recently. I met her family and her six pet lizards, she drove me around and even offered me her bed to sleep in! I also love this job because I feel like it’s the most effective work I could be doing to help build the renewable energy movement in Australia. Our organisation was founded by some very smart people who know that to get better outcomes for renewables we need more people speaking up to politicians, more diversity, more stories being told to connect to other people’s values, and structures that could magnify all of our voices. So, we are building volunteer networks, supporting leaders, and helping develop the strategy skills and political consciousness of ordinary Australians who think that solar and renewables just make sense. How has the Community Organising Fellowship impacted on your current work? The Fellowship has been very influential. Personally, I’m much more confident in the organising work I’m doing. Having worked through so many skills and tools systematically during the program, I feel like I know what I’m talking about when I make suggestions to the volunteers I work with. And I have heaps of resources and templates to pass on. Our volunteer network at Solar Citizens has been growing rapidly this year and we’ve been developing a lot of our structure as we go. The Fellowship program and the experience that all of the other members of the cohort shared during the retreats has meant I’ve always had good advice to turn to when challenges come up. For more information and to support Taegen and her campaign click here. Cancer Council NSW developed this model to engage, mobilise and organise community members to influence public policy about cancer. While the context of their model is health specific, some of the principles and processes are relevant for other social issues. You can use this model of grassroots advocacy as a starting point, and develop ideas to suit your own organisation. This 90-minute workshop helps differentiate between transactional approaches that aim to mobilise large numbers of people and relational approaches that form deeper connections and identify shared values and self-interest. Participants assess the relational/transactional potential of various tactics, then create strategies that incorporate both. “Embracing Networks” in campaigns can lead to powerful results. Many of the largest campaigns in the world, mobilizing millions of people, use the power of networks. It’s easier than ever to embrace networked campaigning thanks to new technologies that have come on-stream in recent years. 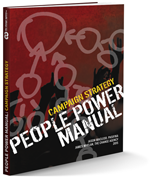 This free download is available for progressive campaigners and organizations who want to learn more about embracing networks to drive powerful results. A report produced by New/Mode and NationBuilder.